Sunday Quote!- Sanctification by Faith Alone? | J.W. Wartick -"Always Have a Reason"
Sunday Quote!- Sanctification by Faith Alone? 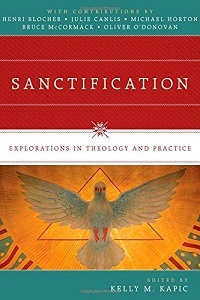 Sanctification: Explorations in Theology and Practice is a thought-provoking collection essays on, well, sanctification. This is a topic I find very interesting and one which seems to need more focus and development in systematics. What do you think? Is this a good argument for the view that sanctification comes through faith alone? If so, how are works involved in sanctification? What is your view of sanctification overall? Sanctification: Explorations in Theology and Practice was a welcome read that introduced me to a host of topics, some of which I wasn’t even aware of before. I recommend it highly. “Living by Faith–Alone? : Reformed Responses to Antinomianism” by Richard Lints in Sanctification: Explorations in Theology and Practice edited Kelly Kapic (Downers Grove, IL: InterVarsity, 2014). « Really Recommended Posts 5/22/15- Mars, Hinduism, Prosperity, and more! I do think sanctification is a gift from God; I think faith plays an important role in sanctification particularly as the outworking of faith (trust) in God and Christ. I think genuine sanctification would be motivated by trust in the Gospel and that’s one distinguishing mark from that of self-righteous work. I think though to think sanctification is only faith without a proper understanding of it’s role to works can be problematic. What do you think J.W.? I think it’s really tough to say that sanctification is immediately or totally imparted through faith. There is something to be said for the role of works in the life of the believer, and I think that can be said without falling into works-righteousness or anything of the like. There is a real danger to the notion that sanctification is immediate or that continued sin might be a sign of lacking sanctification (these latter things aren’t necessarily tied to the views of the essay I’m quoting in this post). It’s a tough issue, and I think each side has some decent arguments. I have a couple other Sunday Quotes coming in the future from this book, which was a really fantastic read. I hadn’t gotten much into the debates over sanctification before, but found the different essays here to be edifying. If work/activity/action is inordinately associated with merit, we will constantly be playing a zero sum game and think that any human activity must be some meritorious work taking away from God’s grace in salvation. When viewed Christologically, synergy is true and necessary to avoid the heresies of Monotheletism and Monoenergism in Christ and hence monergism in us. If God alone is acting or the Personal cause of all human action, there is determinism in Christ and us, as it is our humanity that he has assumed.